Are You Losing Business Because of Poor Phone Skills? Don’t Give Clients or Prospects a Reason to Pick Up the Phone And Call Someone Else! Do you cringe when you listen to your team on the phone? Did you know that the average LEAD costs over $250 to get the phone to ring? The phones are the first point of contact with your company. This is typically where a first-impression of your business is formed. This quick interaction can either MAKE-or-BREAK a sale. Have clients told you, that every time they called your office, the person answering the phone never sounded like they knew who they were? 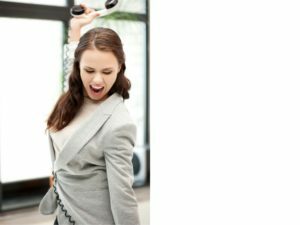 Do your employees speak too quickly, too softly or with a sharp tone when on the phone? Do all of your employees answer the phone with a different greeting? Do you believe that “The Phones” should only be answered by your Administrative Assistant or Receptionist? Why Should You Care About Phone Skills? Did you answer YES to any or ALL of the questions above? POOR PHONE SKILLS COST YOU MONEY! Perception is reality and poorly answered phones can easily turn a happy client into a frustrated one and a curious prospect into a dead lead. Strained calls among team members, leads to isolation and lower team morale. This decrease in morale, directly impacts how clients and prospects are viewed and ultimately spoken to. You are investing time and resources into building your business. Listen to how you and your team answers the phone. Really listen. What do you hear? Is there a disinterested or annoyed tone in their voice? Can you even understand what he/she is saying? How does this make you feel? Ready to talk “Phone Skills?” We are investing so much time and money into just getting the phones to ring. Let’s keep that momentum going! Call me today to schedule your initial consultation.